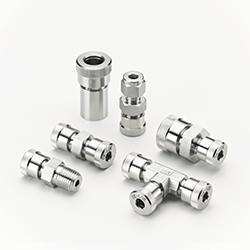 DK-LOK® Ultra Torr vacuum fittings are designed with an O-ring seal that seals to glass metal or plastic tubing. Ease of assembly and disassembly with the seal being maintained through repetitive disassembly. A simple, easy to use product to address specific needs in research and development, analytical and other applications. DK-LOK® continues to expand its product offering in an effort to assist distribution in becoming a single source for customers for all their valve and fitting requirements.